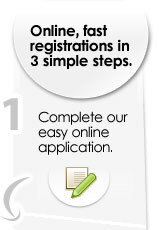 You've reached Australia's instant company registration website. Complete our online form and we can issue your Certificate & ACN within minutes, any time of day. With our award-winning electronic registration system we can offer you the fastest service possible at Australia's best price. We have a direct link to ASIC which means no waiting, no posting, no standing in queues and no fuss. Our award winning service is used by thousands of Australians every year. Companies can be formed any hour of any day. Our super-smart system checks for problems in your application as you complete it. We instantly prepare share registers, certificates, constitution, opening minutes for immediate download.